A lot of different weeks have left their imprint on the pages of history. But there is one week that changed the world. It’s the week that started on Palm Sunday, called Passion Week. Jesus Christ came riding into Jerusalem on a donkey symbolizing His humility. He came fulfilling prophetic Scripture (Zechariah 9:9; Matthew 21:25), while He presented Himself to the nation of Israel as their King. The people went wild with excitement, exclaiming, “Hosanna! Blessed is He who comes in the name of the Lord; Blessed is the coming kingdom of our father David; Hosanna in the highest!” (Mark 11:9-11). The people thought that Jesus would be their deliverer from Roman oppression. On Thursday of Passion Week at the Passover meal, Jesus established Himself as the new and eternal Passover by taking the bread and the grape juice in the cup, and teaching that those elements would represent Him in His upcoming death, burial and bodily resurrection, through which He would win eternal redemption for the world (cf. John 3:16). But on Friday of Passion Week, the people who honored Jesus as their Deliverer had changed their exuberant celebration to malicious condemnation, and cried out, “Crucify Him! Crucify Him!” The Lord was delivered to be crucified, and was flogged with a leather strap embedded with a bone or metal thongs. He was spit upon, ridiculed, a crown of thorns was placed on his head, and was hung on a cruel cross, the most awful way to die, with nails driven into his hands and feet. Amazingly, in the midst of His indescribable suffering, Jesus asked His heavenly Father to forgive His accusers. He died. A sword pierced His side, blood and water flowed, and He was buried in a tomb. On the first day of the week, Sunday, Christ rose bodily from the grave. Today, some think that what happened during Passion Week has no significance whatsoever. It’s just a nice story with no reality. 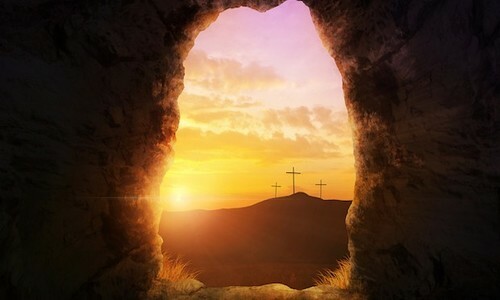 Some may admit that Jesus died but did not rise from the grave bodily. Others try to say that there is some kind of a spirit of resurrection that brings a newness of life at the Easter Season. Still, others believe that all the events of Passion Week actually happened in time, and that Jesus Christ is the Savior of the world. Who is right? The reality of Passion Week resides in the eyewitnesses. The Gospel writers were not reporting fairy tails. They were actual reporters on the scene reporting what took place. They were there when Jesus rode into Jerusalem on a donkey. They saw Jesus crucified. They saw the bodily risen Christ. They saw Him ascend into heaven 40 days later. If the eyewitnesses were called into a courtroom to give testimony to what they saw and wrote, their evidence would be overwhelming that what they saw and reported was true without a shadow of a doubt. But the event in Passion Week that changed the world is the bodily resurrection of Jesus Christ. His conquering the grave meant that He was who He said He was, the I AM, the eternal son of God – yes the God-man and Savior of the world. He is the philosophers’ answer to who is the One within the many. Now forgiveness and eternal life are available to anyone who will accept Him as personal Savior. Now there is eternal meaning for living in this messed up world, as He works out His plan for the cosmos, while promising a future home in eternity for all who believe in Him. So each of us has a choice to make. One can reject Jesus Christ, and even be neutral about Him, which is really rejecting Him. OR a person can become a believer in Jesus Christ, who was telling the truth, and receive His eternal life (John 3:16), which each of us desperately needs. You can’t be on the fence about Jesus Christ. You are either against Him or a believer in Him. I trust you are a believer in Jesus Christ, and you are enjoying the eternal life He has given you. Knowing Christ as your personal Savior, you know as well that Passion Week is the week that changed your life for time and eternity!